Computing the control input for constrained model predictive control (MPC) is a complex and time-consuming process. The constrained problem formulation does not allow the control law to be expressed as a closed equation; instead, a numerical optimization problem has to be performed online at each sampling period. The use of formulations with a priori stability guarantees further increase the complexity of the optimization task. It is a logical requirement for every control law, that the computation time of the control moves must be strictly shorter than the sampling period. Due to the computational demands of the MPC strategy, its implementations have been mostly applied to processes with slow dynamics. 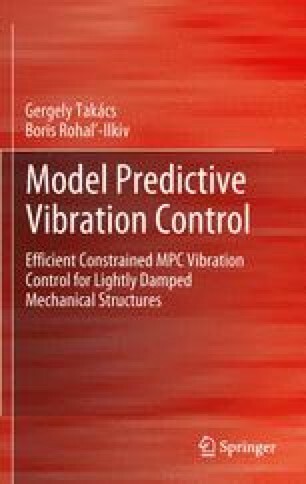 The application of stabilized constrained MPC to plants with fast dynamics, such as active vibration control (AVC), is a challenge even with up to date computing platforms. To allow the implementation of stabilized MPC on high sampling rate systems, this chapter reviews the theoretical foundation of some of the existing formulations that may considerably cut back on computational loads. The core of the chapter is devoted to a method, which sacrifices the optimality of the MPC process in order to create a simple and computationally very efficient MPC strategy. This method referred to as Newton–Raphson’s MPC (NRMPC) is based on a pre-stabilized, augmented state-space formulation with ellipsoidal target sets, eventually leading to an online algorithm only requiring the computation of a polynomial root. Instead of sacrificing optimality, another major line of efficient MPC formulation uses multi-parametric programming to transfer the online computational load into the offline regime (MPMPC). In addition to reviewing the theoretical essentials of this explicit MPC approach, other efficient MPC methods are briefly revised as well.